Dearest Blog: Yesterday I had the opportunity to catch a couple of awards darlings before they're chased out of town by Adam Sandler or Transformers 47: The Search for Shia LeBeouf. 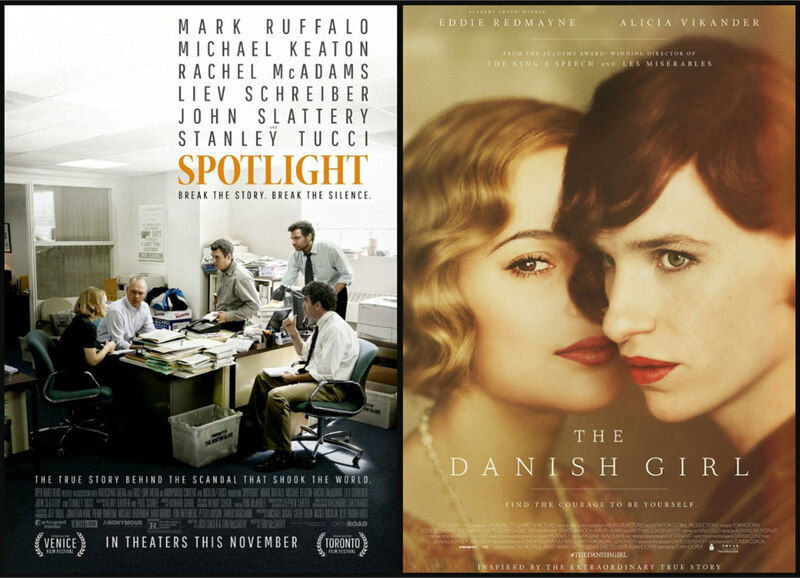 On the docket: Spotlight and The Danish Girl. Spoiler level here will be mild, nothing you wouldn't know from the trailers. First up: Spotlight. The Boston Globe exposes the cover-up of a horrifying pattern of sexual abuse by Catholic priests. Spotlight is simultaneously one of the most brilliant and one of the most difficult-to-watch movies I've ever seen. The events depicted in the film turned my stomach more than any death-defying stunt or gratuitous gore, not just a systematic failure to protect the defenseless, but, worse, a conspiracy to hide and excuse (EXCUSE!) such abuse. Performances are top notch across the board, with Mark Ruffalo especially impressive in what amounts to the leading role among the strong ensemble. Liev Schreiber is outstanding as always in a smaller part, one of the top five actors in the world, for my money. The plot is gripping, as the reporters dig deeper and deeper into a plot that reaches higher and higher into the hierarchy of the Catholic Church. Despite a runtime that's well over two hours, I was riveted the entire time, even though I wanted to scream at the screen as family members, Church authorities, and legal officials made excuses and attempted to keep the story from getting out. As the end credits began to roll, and the film presented a list of the many, many communities impacted by this epidemic, I was overcome with grief, not only for what happened, but for how much could have been prevented. I cannot remember the last time a movie left me this angry and heartbroken. Spotlight runs 128 minutes and is rated R for "some language, including sexual references." This year's Oscar Best Picture race is a tight one, but Spotlight has won my heart and my vote. Of a possible nine Weasleys, Spotlight gets nine. Next on my agenda: The Danish Girl. Oscar winner Eddie Redmayne stars as transgender pioneer Lili Elbe. Whereas Spotlight is a captivating story featuring stunning acting, The Danish Girl is mostly noteworthy for the performances alone. The story itself *should* be fascinating, but, as told here, is just slow and somewhat dull. Though much decorated, I find Eddie Redmayne an awkward performer, almost painful to watch in this film. It's undeniably a brave performance, but I'm not sure it's a great one. Alicia Vikander is stellar, really a co-lead even though she's been considered a "supporting" player for awards purposes, and Amber Heard provides some welcome light in what's overall a pretty angsty tale. The film boasts beautiful locations and a lovely score, and, though we may have a long way to go, it's a nice reminder of just how far the world has come on the issues faced by transgender individuals. Though sluggishly paced, The Danish Girl is worth seeing for its solid performances and important subject matter. Of a possible nine Weasleys, The Danish Girl gets six.